”It will be exciting to see how the co-operation can be developed and function as an inspiration for the local congregations," says bishop Christian Alsted (right) from the Methodist Church in Denmark. "One faith, one baptism, one grace.” That is the title of the first national bilateral agreement between the Evangelical-Lutheran Church in Denmark The Methodist Church in Denmark (as a part of the United Methodist Church). ”It has been an exciting learning process, and we have grown much closer to each other. 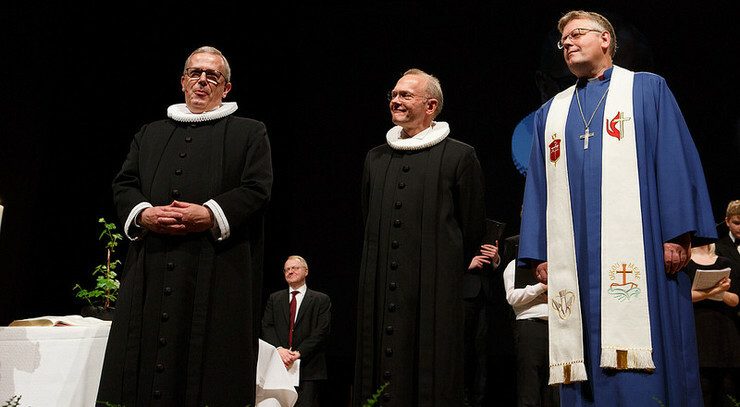 There are still theological differences between the churches, but with the agreement we demonstrate that we have established a very good relationship with each other, and that there are excellent possibilities for future co-operation,” says Henning Toft Bro, bishop of the Diocese of Aalborg. ”It will be exciting to see how the co-operation can be developed and function as an inspiration for the local congregations. Through this agreement we also meet the commitment to continued dialogue between the churches, which is the one of the principal ideas of the Leuenberg Communion. So the Methodist Church and The Evangelical-Lutheran Church in Denmark will continue the mutual dialogue, also after the agreement is in place,” says bishop Christian Alsted from the Methodist Church in Denmark. The agreement will be celebrated in Strandby Methodist Church 4th of March 2018 at 10 a.m. and Copenhagen Cathedral 11th of March 2018 at 10 a.m. Everyone is welcome to join.